Eli Roth traded in his R-rated horror sensibilities for a PG, family-friendly affair with The House With a Clock in Its Walls and that proved to be a winning combination, as the movie topped the box office with $26.6 million last weekend. But this weekend sees a pair of new arrivals that will be duking it out for the top spot with the animated feature Smallfoot and the Kevin Hart comedy Night School expected to beat last week's champ. As is often the case during slower months, a kid-friendly movie can sneak in and capitalize. 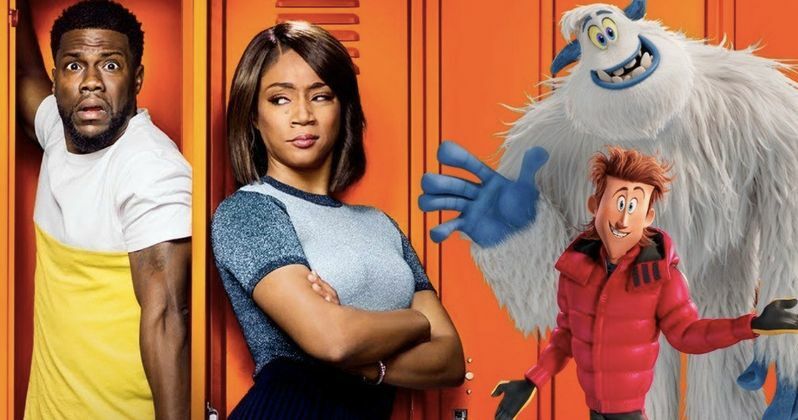 That's what Smallfoot, which features a voice cast that includes Channing Tatum, Zendaya and Common, is trying to do. The twist on the Bigfoot legend should easily win the weekend with around $25 million, give or take. Kevin Hart will land in the number two spot with Night School, which teams him with Tiffany Haddish, who has been red-hot since last year's hit Girl's Trip. This serves as director Malcolm D. Lee's follow-up to that comedy and should bring in around $18 million. Last week's winner will have to settle for the bronze medal as The House With a Clock in Its Walls will land in the number three spot. Expect to see an average-ish drop of around 50 percent week-to-week, meaning the Jack Black and Cate Blanchett vehicle should bring add another $13 to $14 million to its total. That's not bad, considering Eli Roth's latest cost a relatively modest $42 million to produce. Rounding out the top five will be one of the weekend's other new releases, Hell Fest. The slasher flick will benefit from the fall moviegoing crowd who are feeling eager for the Halloween season to kick off and the wide-release should nab between $8 and $10 million for a solid debut. Director Paul Feig's critically-acclaimed A Simple Favor has held over well week-to-week so far and should land in the number five spot with another $6 to $7 million. Word of mouth has really helped Feig's latest quite a bit. Also not to be overlooked, Robert Redford's final movie, The Old man and the Gun, which has been getting very positive buzz up to this point, is hitting theaters in limited release this weekend. Looking ahead to next week, we've got a pair of huge releases with Sony's Venom and the Oscar hopeful A Star Is Born, which stars Lady Gaga in the lead role, both hitting theaters and they're both set to do big business. Be sure to check out our full list of predictions for this weekend's box office and check back with us on Sunday for the weekend estimates. These numbers were provided by Box Office Mojo.